U-Weld-It kit to make a pair of Mordor exhaust tips. 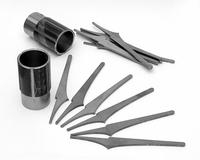 Includes all parts as shown, 2 machined tips and 12 laser cut fins. And the 2 set screws.